Have you ever been at work and there was a sudden power cut? Have you ever dealt with the complexity and cost of getting electricity for the equipment? Have you ever had a power failure caused by bad weather conditions or natural disasters? 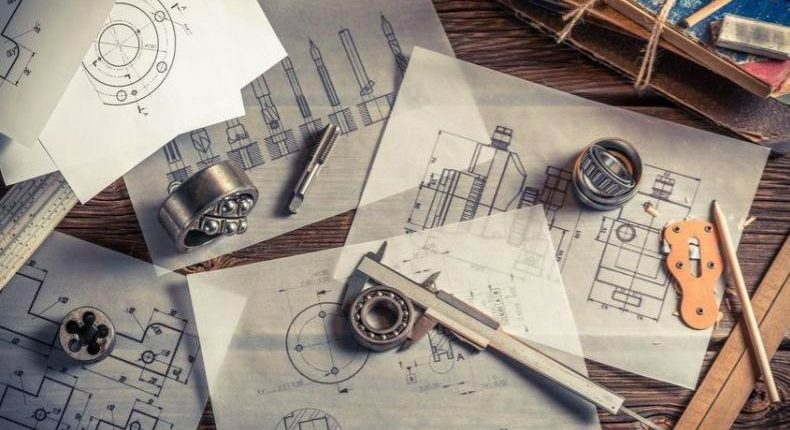 Sacyr, Kemtecnia, and Ariema, together with Universidad de Huelva as a scientific partner, have carried out a project that solves all these problems. It is called Aurora, and it is framed within the Feder Innterconecta program funded by CDTI. It is a portable, scalable, self-foldable, monitoring-enabled and remotely reprogrammable system for electricity generation which uses renewable sources. The energy generation is pollution-free, with almost no thermal footprint or noise, and guarantees 24/7 power supply. Besides, it solves the two main issues with renewables: discontinuity of supply and the impossibility supply remote places. What is the Aurora Project About? 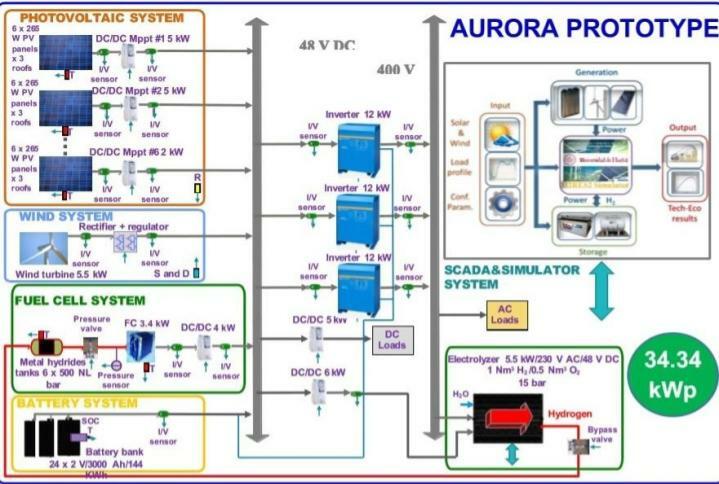 In essence, the Aurora Project is an environmentally-friendly renewable energy generation system which has 4 electricity generators: photovoltaic, wind, battery and fuel cell that includes an electrolyzer for H2 and oxygen in situ production from water. The H2 is stored in metal hydride and it feeds the fuel cell. The resulting medical oxygen can be purified to be used in field hospitals, disinfection, etc. Aurora can be remotely monitored, controlled and even reprogrammed via WiFi, cable, mobile phone or radio from a Control Center. Besides, all Aurora systems around the world can be managed from this center. Aurora can also have a social application for NGOs, catastrophes, emergencies or any other applications where a generator is required. The wind and photovoltaic systems are continuously generating energy as long as there is a renewable source available, be it solar and/or wind. When the demand for charges is inferior to the available power and the batteries are already fully charged, the electrolyzer starts to produce H2 to be stored. When the demand is higher than the available power in the wind and photovoltaic generators, the battery systems gives support to compensate for the deficit. If the batteries reach the discharge level previously set by the control system, the fuel cell starts working to avoid surpassing it. There are 96 265 Wp photovoltaic panels which provide a total power of 25,44 kWp. The converters have a maximum power point tracker to help optimize the photovoltaic production of the panels. These converters measure the irradiance and superficial temperature to detect failures, maintenance needs and to make sure the power generated is the highest possible for the current solar radiation. It has one 5,5 kW wind generator. It has a fuel cell refrigerated by 3,4 kW air. The fuel cell is powered by a bank of metal hydride tanks which incorporate a temperature regulation system for a better H2 absorption/desorption. 24 2 V batteries connected in series. The batteries form a 3000 Ah/144 kWh bank. This battery system operates as generator or charger. It has two busbars: the AC busbar can be configured through the DC busbar using 3 12 kW inverters/chargers. The direct current charges can be powered from the busbar DC or through a DC/DC elevator/reducer if the power is different than 48 V.
The 5,5 kW electrolyzer generates H2 from water, which is stored in the metal hydride tanks to power the fuel cell. The electrolyzer can be powered using AC or DC. The direct current can be used when Aurora is interconnected into an existing electric network. 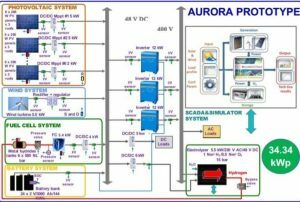 It receives information from all relevant variables and controls Aurora following the preset program for a specific mission. It is a multilayered centralized control with a supervisor control for local controllers. Based on data from the data acquisition system and the programmed elements, it regulates the energy flow depending on the charge demand, the ability to generate primary renewable energy and the status of the batteries and the H2 storage. All the Aurora elements are kept in two standard interconnected containers. 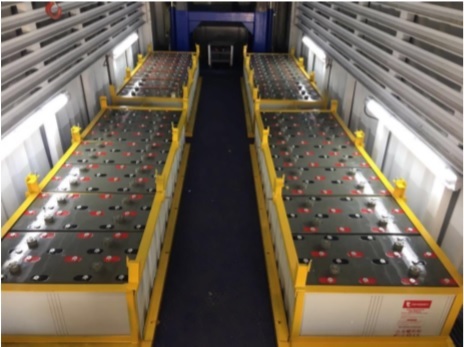 The main container is 40 feet (12m) and houses the wind and photovoltaic generators, the battery bank, the DC and AC busbars, the electric controls and switchgear, the power conditioners, and the supervision and control system (SCADA) with the simulator. The H2 container is 20 feet (6m) and houses all the H2 systems: fuel cell and the power conditioner, hydride tanks, electrolyzer and the H2 circuit auxiliary elements. Aurora is ready to hit the market with the requested functionalities an power from 70 to 300 kW. 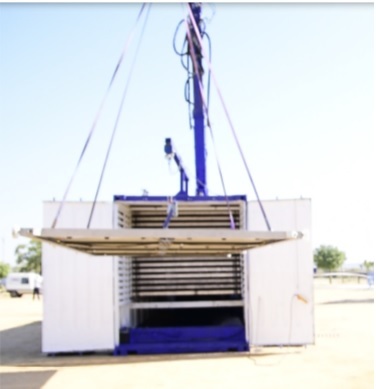 This equipment can generate electricity at a very competitive cost compared to diesel generators, even more so when looking at the environmental cost and the logistics of gas transport for the generator. 1) Guaranteed continuous supply 24/7. 2) No polluting gas emissions. 3) H2 in situ production. 4) No environmental impact during set up. 5) It can produce medical oxygen. 6) It is fully autonomous, no need for fuel supply. 7) It is modular, its power can be increased depending on the need. 8) It can set a smart grid thanks to the SCADA system. 9) It can be remotely monitored, controlled and reprogrammed. 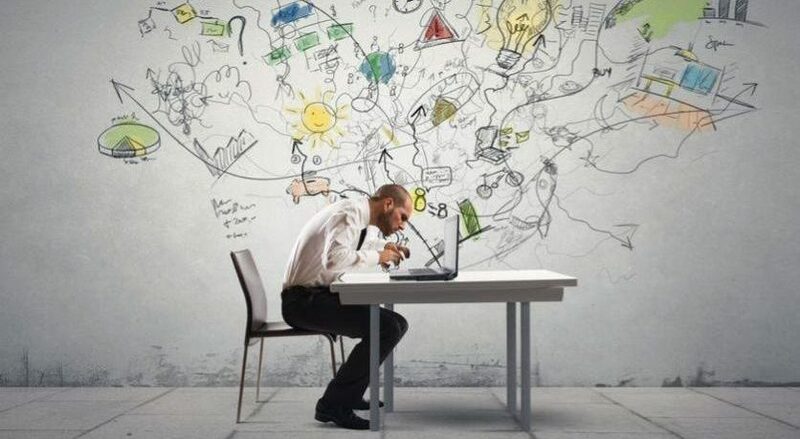 10) It reduces cost and maintenance time. Check out this video to see how Aurora works! 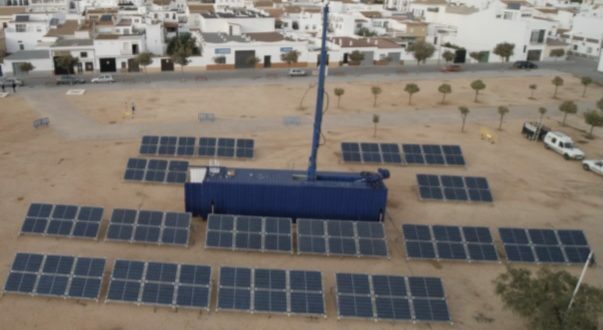 Do you think this will be a good renewable alternative for remote areas in the short term? 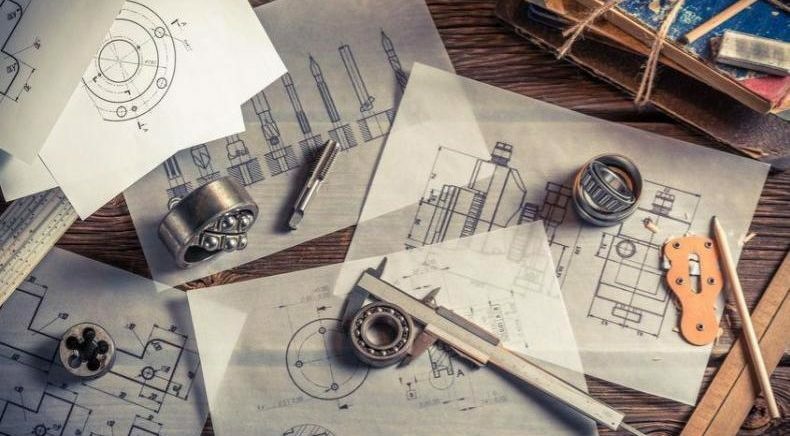 Do you know any similar projects that are being developed in other parts of the world?